Revitalize the interior of any room you are renovating with our expansive selection of wood flooring. Hardwood floors are a great way to add character and warmth to your home, and our design team can find the right grain and stain for your particular design theme. With so many wood flooring types to choose from, it helps to have the support of an experienced sales associate with your best interests in mind. Learn more about the wood floor options we offer, and how they can improve the ambiance in your home. Live in the home you have always dreamed of by making the move to custom wood floors. Each and every home is different in its own way, so it is critical that you get accurate measurements and the right type of flooring to meet your needs. We take the time to ask you the important questions about your home and your preferences, so you get a variety of wood flooring choices that will stand the test of time. Enjoy the authentic look of oak wood flooring in your den instead of the threadbare carpeting you have been living with for too long. If you are working with a limited budget, or you need the look and feel of wood in a place that has high levels of moisture and temperature variations, our engineered wood is the right way to go. We also offer flooring options that are crafted from reclaimed wood, which helps to protect our environment. If ease of maintenance is also a concern, our solid wood flooring gives you a surface that offers dirt and dust no place to hide. Save time and money on your next project by taking advantage of our wood flooring installation process. You can have the real wood flooring you have always dreamed of at a price that makes sense. Create an integrated design theme that matches your décor by choosing from our extensive selection of wood flooring types. Depending on the room in question, and the available budget you are working with, we can identify the right type of wood flooring for your particular home. Our design team reviews your decorating plan and provides you with beautiful wood floor options that fit your needs. Maximize the value of your home improvement dollar by making our showroom your source for custom wood floors. This is where our commitment to accurate room measurements makes such a difference. With the right measurements and a better understanding of your design plan, we help you find the right style and material for any room you are renovating. 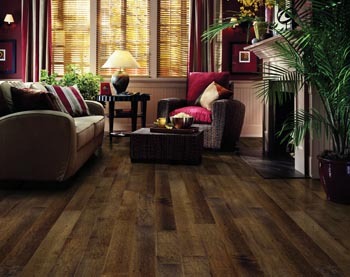 With a new customized wood floor in your home, you are sure to catch the eye of potential buyers and neighbors alike. Enhance your home’s interior by making the move to oak wood flooring. This resilient variety of wood offers a timeless look for any room without it costing you a fortune to install. Our sales associates take the time to ask you about the room you are decorating and the conditions you may experience there. If you are in the market for a variety of wood flooring that is resistant to moisture and temperature changes, our selection of engineered wood is the right choice. Engineered wood flooring can be installed in basements and kitchens, and it costs less as well. If you are in the market for a variety of flooring that is environmentally responsible and attractive as well, our reclaimed wood is the solution. Update the look and feel of your home with the vintage appeal of reclaimed hardwood flooring. Fill any room with natural patterns and original color when you purchase our solid wood flooring. Without the seams that come from standard plank flooring, solid hardwood makes it as easy as ever to keep your floors looking as great as the day they were installed. Protect the investment you are making in new home flooring by making our contractors your source for wood floor installation. We want you to be as happy as possible with your new flooring purchase, and that is why we provide you with a contractor that comes equipped with the right tools for the job. With the right look and the perfect fit, your real wood flooring is sure to increase the value of your home. Contact us today for the added character and appeal that comes from wood flooring, and take advantage of our free room measurements. We proudly serve customers in Hilo, Hawaii, and surrounding communities on the Big Island.